Under the cross-polar light from an optical microscope, this thin section of a rock almost looks like it could be stained glass. The grains of olivine and pyroxene in this peridotite sample display vibrant birefringence interference colors. Not all minerals have such vivid hues under a microscope, though. A mineral’s birefringence depends on its refractive index and the polarization and propagation direction of light. Birefringence value is determined by the difference between the largest and the smallest refractive index of a mineral section. 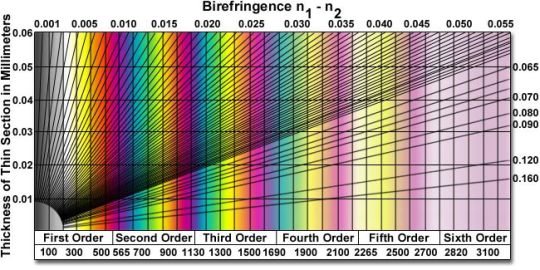 A Michael-Levy interference color chart (above) can be used to determine a mineral’s birefringence value. Once you find the observed interference color of your mineral on the chart, choose the nearest vertical line to it Then, follow that vertical line up until it intersects with the horizontal line that corresponds to the thickness of your thin section. From that intersection point, follow up the corresponding diagonal line to the mineral’s birefringence value. Olivine has birefringence values from 0.033-0.052, so with a thin section 0.03 mm thick, we observe these beautiful, vibrant rainbow hues.